Basic Watercolour is the introductory book for watercolour beginners. 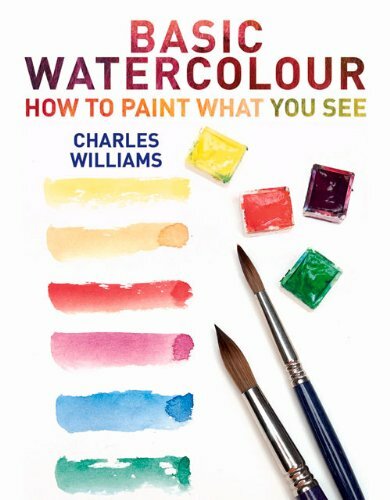 The author is Charles William, a watercolour artist and instructor for more than 20 years. The book covers the tools you need, basic techniques to painting and drawing. The tutorials and instructions are simple enough to follow. Along the way, he also provides some anecdotes and mistakes from his own students as learning points. The tone is conversational and encouraging. There are insights from his own experience and he also talks about the techniques of other artists. There's a section on observational drawing which is helpful and he talks about how you can draw what you see with some simple techniques such as using negative space, proportion and perspective. In one chapter, he teaches the techniques as used in John Ruskin's book The Elements of Drawing. The technique is about using an light tonal watercolour wash that forms an under-drawing first before you fill in with actual watercolour. It's quite a different technique that other beginner watercolour books teach. It's good to know but sometimes you can make do without any under-drawing too. The last section features interviews and selected works from six contemporary artists. Some of the works are good, some don't appeal much to me. The interviews are interesting to read though. The watercolour examples look alright as in there are many other beginner books offering better looking subjects even if it's just a simple apple or orange. I felt that the book may be draggy at times especially for those who prefer a much more hands on approach.